Each standard coated floatation device consists of a piece measuring 12″ x 16″ x 96″. However, custom sizes are available as well. 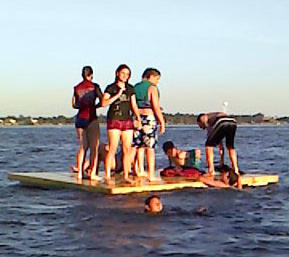 Dive into summer fun from a dock constructed with affordable, durable Benchmark Foam dock floats! Currently, Benchmark Foam is offering this durable, lightweight, easy to manage product for $250 per piece (standard size). Prepare to enjoy summer to the fullest! Call us today at 800-658-3444 or 605-886-8084 for complete details and to discuss your specific dock needs. Our team can assist you from planning stage through the agreed-upon delivery date. As the only manufacturer in the industry with an On-Time Guarantee, quick response and outstanding customer service is exactly what you’ll receive!